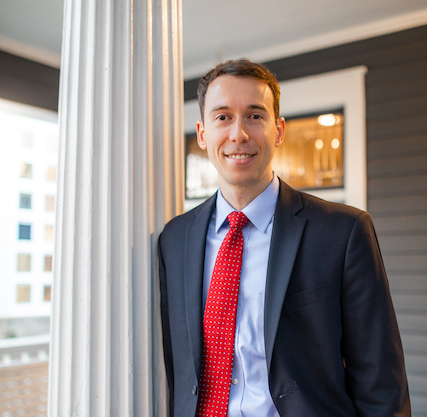 Kevin joined Lindley Law in 2019, and represents clients in civil litigation, particularly commercial dispute, landlord/tenant, creditor’s rights, employment law, and trusts and estates matters. He volunteers through the NC LEAP program, providing legal assistance to entrepreneurs and small businesses. Prior to joining Lindley Law, Kevin practiced with Womble Bond Dickinson (US) and was active in a number of the firm’s pro bono initiatives. He also volunteered with Triangle ArtWorks, a Raleigh-based nonprofit organization providing legal and business support to community artists. Kevin earned his J.D. from the University of North Carolina School of Law. As a student, he was a staff writer for the North Carolina Journal of Law & Technology, the President of the Sports and Entertainment Law Association, and a chair and host of the 2015 UNC Law Revue, which raised money for student pro bono initiatives. He is a recipient of the Eugene Gressman & Daniel H. Pollitt Oral Advocacy Award. Kevin earned his bachelor’s degree, with honors, from the University of South Carolina, Columbia, in 2008. From 2008 to 2013, he worked professionally in the independent film industry on various projects throughout the Southeast. He also worked for marketing firm in upstate South Carolina. In his free time, Kevin enjoys reading, practicing French, and spending time with his wife and two kids. He is a self-taught multi-instrumental musician and an avid soccer fan.